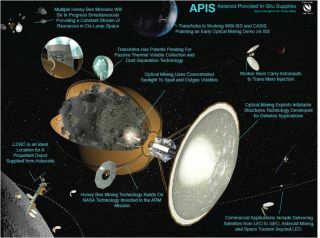 An innovative plan to use “optical mining” is part of the Asteroid Provided In-Situ Supplies (Apis) concept — an ability to tap mega-amounts of water from space rocks to help establish valuable infrastructure in space. PASADENA, Calif. — A new way to harvest asteroid resources is being eyed as a possible game changer for space exploration. The patent-pending innovation, called "optical mining," could allow huge amounts of asteroid water to be tapped, advocates say. This water, in turn, could provide relatively cheap and accessible propellant for voyaging spacecraft, lowering the cost of spaceflight significantly. Planetary Resources is one of several private companies hoping to mine the precious metals and water ice from asteroids. See how asteroid mining could work in our full infographic here. "We're putting together a business model … one that moves reusability into space and more commercial methods and practices into deep space," Apis principal investigator Joel Sercel, founder and principal engineer at ICS Associates Inc. and TransAstra, told Space.com. Sercel said that Apis can support NASA's plans for human exploration by providing mission consumables and propellant for all missions of the agency's Evolvable Mars Campaign, including human exploration efforts to lunar orbit, crewed missions to near-Earth asteroids in their native orbits, exploration of the moon and exploration of Mars. Sercel formerly worked at NASA's Jet Propulsion Laboratory in Pasadena, California, and was a lead innovator for the NASA Solar Technology Application Readiness (NSTAR) ion propulsion system. NSTAR powers NASA's Dawn spacecraft, which is currently orbiting the dwarf planet Ceres. Sercel said that the optical-mining approach aims to excavate carbonaceous chondrite asteroid surfaces and drive water and other volatile materials out of this excavated material and into an enclosing, inflatable bag, all without the need for complex or impractical robotics. The Apis plan involves harvesting up to 100 metric tons of water from a near-Earth asteroid, and taking the material to lunar orbit or other depot locations, using only a single SpaceX Falcon 9 rocket launch, Sercel added. Apis team members have already performed computer simulations and lab experiments on meteorite samples to get a better idea of how to approach the intended work in space. Sercel and his colleagues are using their large solar furnace at the White Sands Missile Range in New Mexico to shed light andheat onto the idea. Since the late 1970s, researchers have used this furnace to simulate the sudden heat generated by a nuclear explosion. The furnace makes use of two primary sets of mirrors. One large, flat set can pivot around to seize the rays of the sun and direct them though a shutter system onto the second set of mirrors, which, in turn, focuses the light and heat onto the target. In the September-October time frame, Sercel said, the Apis team will do proof-of-concept experiments at the White Sands facility. Hardware brought to the test site will hold cantaloupe-sized asteroid simulant targets that will be superheated by reflected and concentrated sunlight. This solar furnace at the White Sands Missile Range in New Mexico uses mirrors to focus the sun onto a small point. Normally used to simulate the heat from a nuclear explosion, this high-tech blast oven is slated for use to test an in-space idea for using asteroids. The same gear has been used to test a theory that a space-based version of the furnace could be used to deflect a meteor headed for Earth. The products of interest to Sercel are volatiles, especially water. Volalites can be harvested from rock by a process called spalling, in which tiny, explosive pops of expanding gas drive out particles and gas. Sercel said that the New Mexico tests could show that highly concentrated optical energy excavates the surface of material in a controlled way, analogous to how intense lasers can ablate surfaces, constantly exposing new material and forcing water out of the spalled material. "It actually digs holes and tunnels into the rock. The heat goes in, is absorbed in thin layers and drives out the volatiles in tiny, explosivelike pops that eject material in a controllable way," Sercel said. "We believe that highly concentrated sunlight can drill holes, excavate, disrupt and shape an asteroid while the asteroid is enclosed in a containment bag." But in the Apis case, the inflatable capture system is fabricated from high-temperature material and designed to fully enclose the target. After the asteroid has been encapsulated and de-spun, an inflatable solar concentrator churns out direct solar-thermal energy to the asteroid surface. This heat is used to excavate the asteroid and force the water to outgas into the enclosing bag. From there, the outgassing water is pumped into a passively cooled bag and stored as solid ice. Up to 120 tons of water, collected over several months, could be stored in this manner, Sercel said. The Apis system would then transport the harvested water to lunar orbit, using some of the asteroid water as fuel for its onboard solar-thermal propulsion system. Once in orbit around the moon, the water can be converted into consumables and propellant to support a variety of enterprises, including human exploration beyond low-Earth orbit. "Apis is a commercially viable approach to the extraction, processing and delivery of water from asteroids to in-space assets," Sercel concluded. Along with Sercel, mining experts are digging into the question of how best to extract and exploit space resources. "After many years of dead-end investigations trying unsuccessfully to adapt terrestrial mining techniques to extract resources from asteroids in the future, we are excited to finally participate in the development of what we consider the most feasible and effective technique to recover valuable volatile elements, such as space propellants, from asteroids," Angel Abbud-Madrid, director of the Center for Space Resources at the Colorado School of Mines in Golden, Colorado, told Space.com via email. Both Abbud-Madrid and Chris Dreyer, also from the Center for Space Resources, are working with the TransAstra team on several projects exploring the optical-mining concept.